Click to enlarge The Rap Conect Reloaded concert has returned from its sabbatical with a series of events set to rock Lagos and the entertainment industry. The program, dedicated to showcasing developing rap artists and bringing them to the limelight has seen the likes of (Olamide,Falz, Cynthia Morgan, Seriki, and many more start up with them. While rap may not be very common in Nigerian music, it is clearly much appreciated. 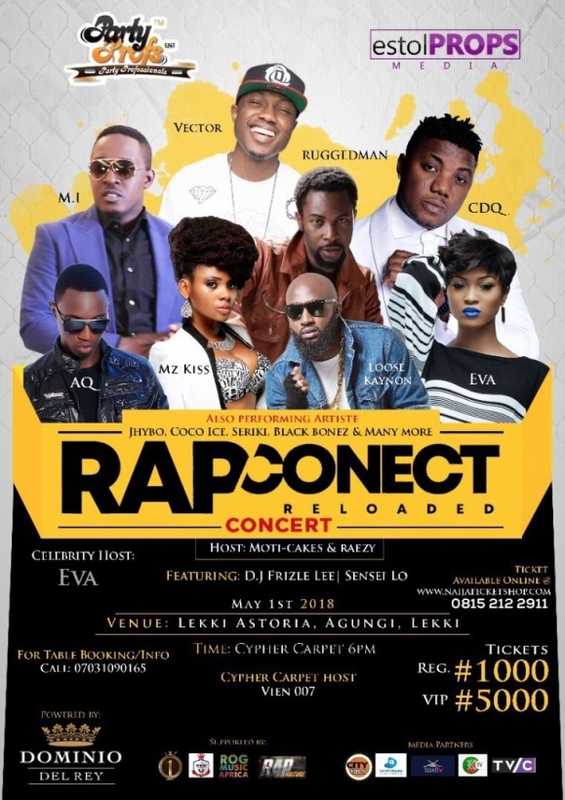 Therefore, this year's Rap Conect Reloaded has commenced its activities starting with the online rap battle that takes place on instagram between 6th-22nd of April. Budding Rap artists are asked to make a 50 second freestyle video using the hash tag #dominatewithdominio as the theme for the freestyle and the winner from as shortlisted ten would win a sum of fifty thousand naira (=N= 50,000). The winners from the online rap battle and the school rap battle would then go on to perform at the main concert holding on the 1st of May at Lekki Astoria, Agungi, Lekki Lagos. Performing this year are, MI, Vector, CDQ, Eva, Loose Kaynon, AQ, Black bonez, Seriki, Miz kiss, Iceberg slim, Rugged man, Coco ice, Jhybo and many more. Tickets to the main concert would be sold at 1000 Naira regular while VIP is sold for 5000 Naira. Tickets are sold online at www.naijaticketshop.com. It promises to be a revolutionary event. Hosts: Moticakes (sound City), Eva Alordiah and Raezy (Rhythm Fm) while the cypher carpet host would be Vien007(City FM). This year’s Event is Proudly Sponsored by Dominio Del Rey and supported by 100 crowns, wrap league, Rog Music Africa, Rap Kulture, City FM, Handy Media, Taxi TV, Wap TV, Koga TV and TVC. Bullet Description: It promises to be a revolutionary event.